If you don't mind my daring, she could give Katniss a run for her money. Although their strengths are different, that's true - but they're both very resilient and persisent, and the little sisters always, always steal my heart. 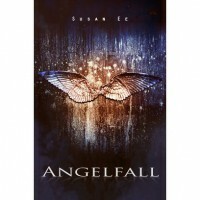 Angelfall starts with a bang: the end of the world is happening, and the angels from the bible - terrible warriors, no winged sweethearts here - have attacked. Penryn is alone, in charge of her schizophrenic mother (oh boy, I have so much to say about the mother) and invalid little sister, Paige. While trying to escape, Penryn and her family accidentally walk straight into an angel fight, and one of them has his wings cut off (ouch). To make matters worse, Paige is kidnapped by one of the bully angels and the other one is left to die on the street. Penryn, with more guts and desesperation than fear (always a delightful combination), decides to drag the angel into an abandoned former office, because she wants to make a deal with him - she'll give him his wings back if he takes her to where her little sister is. I adored this book. It was fast-paced - no meaningless chattering, no bland in-between monologues to fill space. Penryn had an objective and she followed it with single-minded passion. Rafe, the angel she rescues, is - cheeky and apparently indifferent to her, and very mysterious - we hardly learn anything about him, other than he's a deserter (but why? What happened, when, how, answer me!!). And the matter of the children - my, my, my. I'm telling you, I started to read horror books when I was seven years old, I do not scare easily - overactive imagination, thank you - but that was freaking creppy, oh my gosh. I LOVED IT. I don't want to talk much about it for fear of spreading spoilers - which I do so hate - but man, oh my gosh, MAN. There are no disappointments at all with this book. Penryn's mother - wow. Maybe Penryn's so strong because her world's always been half-ending, with a mother like that - I especially enjoyed the fact that Penryn did dislike her, did resent her. My grandfather is an alcoholic and I can tell you honestly after some time, the feelings muddle together, all the love and the hate and the tiredness - and Penryn showed that with almost painful precision. She was unspeakably strong, but she too had moments of sentimentality - Paige's chocolates, her wheelchair. Rafe at those times was a sweethearts. I liked so much their bickering! They were like young children fumbling with their first attempts at flirting in the playground (so am I good with metaphores or what). Everything, everything about this book was so great! Can't wait for the next one.